What is it with big cans and big beers? It seems local brewers can't resist the temptation to up the booze when they up the volume. 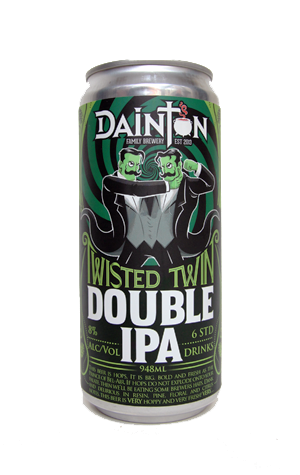 Pirate Life's IIPA is probably the best known example but now, as a means of getting its new double IPA to people (and perhaps offer a "nudge, nudge" to people in advance of its own canning line arriving later in the year), Dainton Family Brewery has decided to send the Twisted Twin DIPA out in nigh on one litre beasts. There are kegs of the 8 percent hop bomb around too, but most eye-catching is the limited number of CANimals they've put together with online retailer Hops To Home. Just over 100 of the colourfully adorned mega-tinnies have been produced, each containing a "this beer is made for sharing" six standard drinks. The drink itself was voted for by fans of the Melbourne brewery and is, they tell us, the hoppiest drop they've brewed to date. That said, they had the decency to build a pretty formidable platform of sweet caramel malts from which to launch the assault of fruity, floral and piney hops. So, for all the talk of hop monsters, it's more a case of hop flavours targeting your palate rather than any insane bitterness. All of which means that the CANimals could be just as good for sharing with oneself.